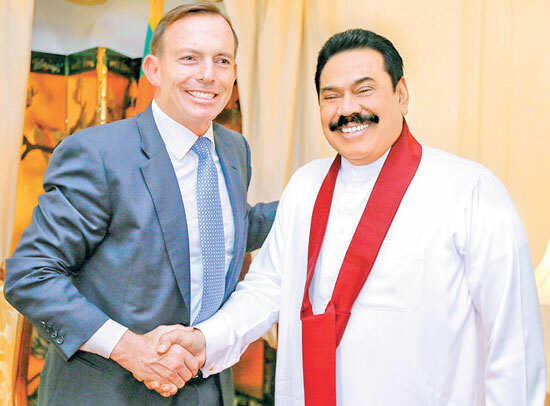 President Mahinda Rajapaksa met Australian Prime Minister Tony Abbott on the sidelines of the 69th United Nations General Assembly in New York City yesterday. The Australian leader commended Sri Lanka for its successful implementation of the recommendations of the Lessons Learnt and Reconciliation Commission and the country maintaining a 7.8 percent GDP growth. Pic: Sudath Silva. A special court in Bangalore yesterday convicted Tamil Nadu Chief Minister Jayalalithaa Jayaram, in an 18 year old, Indian Rs.66.65 crore disproportionate assets case, the Indian Media reported. After finding her guilty on all counts, the AIADMK leader has been served a four-year jail term and a Rs 100 crore fine. Australian Prime Minister Tony Abbott commended President Mahinda Rajapaksa for implementing the LLRC recommendations, when the two leaders met on the sidelines of the United Nations General Assembly in New York on Friday, President’s International Media Unit Spokesperson Anuradha Herath said. Mass Media and Information Minister Keheliya Rambukwella said as far as the Government is concerned, it has secured power in most of the Uva electorates and it had some downward trends only in one or two areas at the recently concluded Uva Provincial Council elections.